PUNE: “My learning in music wouldn’t ever stop. Self-confidence is the only thing that is driving me. 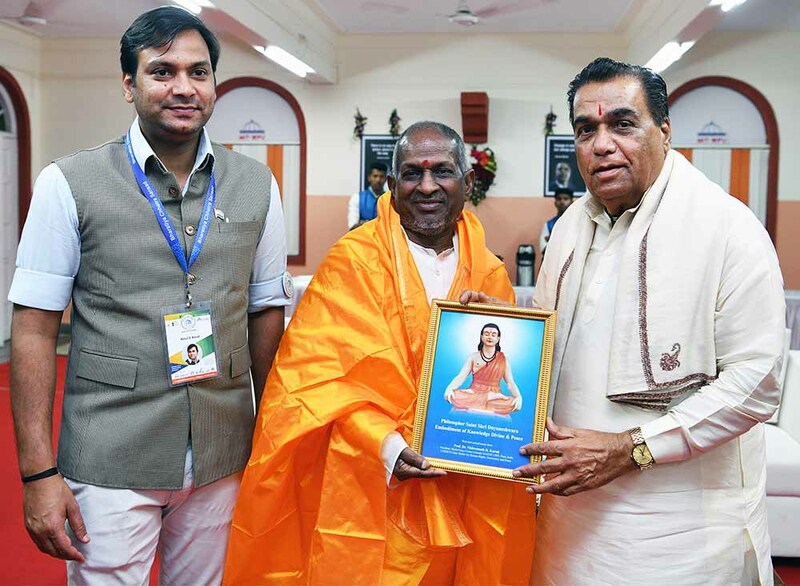 I am composing music till now which means I do not know music,” said Thiru Isaignani Ilaiyaraaja , Padma Vibhushan and acclaimed Music Director and Composer. He was speaking as the Chief Guest of the Valedictory Function of 9th Bharatiya Chhatra Sansad. This event was being held at MIT-WPU Campus at Kothrud Pune. The Bharatiya Chhatra Sansad (BCS) is organized by MIT world Peace University and MIT School of Government, Pune. Present on the occasion were Dr. Raghunath A. Mashelkar, Padma Vibhushan, Eminent Scientist, Dr. Abhay Firodia, Chairman, Force Motors, Shri. Tushar Gandhi - President, Mahatma Gandhi Foundation, Dr. Vandana Shiva, Eminent Environmentalist, Prof. Dr. Vishwanath D. Karad, Founder President, MIT World Peace University Prof. Rahul Vishwanath Karad, Executive President, MIT World Peace University, Dr. Chandrakant Pandav, Pandit Vasantrao Gadgil, Prof. D. P. Apte, Registrar, MITWPU, Dr. Shrihari Honwad, Dr. R.M.Chitnis, Dr. Sayali Gankar, L.K. Kshirsagar on the Dias. Rahul Karad addressed the gathering and said, “The Bharatiya Chhatra Sansad is not an event, it is a mission. It is the only platform in the vastness of the country that urges educated people to come to polity. It is a simple but very important idea. MIT-School of Government, the only school in the country to create future political leaders.” Nilam Sharma and Prof. Gautam Bapat Compered the function. Prof. D.P.Apte gave the vote of thanks.